Best Home Table Saws Under $350! Got a long “Honey-Do” list? No worries. We’re here to help you get it done! A table saw can be a lifesaver when you’ve got to make accurate cuts, like for shelving, cabinets, tables or other work that has to be perfectly cut in order to be glued and screwed together right. If you’ve ever tried to build anything, you know that square and straight are more than just old-fashioned words your grandpa used to use. They’re important parts of building anything from a doll house to a real house and you need a table saw that can do the job. So, ready to tackle that list? Then let’s get going! Whether this is your first table saw or you just need an upgrade, make sure that the saw you choose has all of the safety features you need. You only get one chance with a table saw, so make sure you’re using it safely! The power of the saw’s motor will make a difference when cutting through hard woods like maple or making multiple cuts over extended periods of time. Be sure to pick a saw with enough power to get the job done but, don’t worry, we’ve done the research for you! Don’t underestimate the importance of this little feature. The rip fence is what keeps your board aligned with the blade to ensure a straight cut. If that fence is more than .005” off, you’ll never be able to make a straight cut. Avoid the frustration of having crooked shelves and wasting expensive material by getting a saw with a good rip fence. There’s only so much room for stuff, right? Keep it simple and check out some of the compact, portable table saws we’ve reviewed for you if space is an issue. If you’ve got the space, great! Then look at the stand saws that will help you get the job done. Do you know what you’ll be cutting? If you need to cut sheet stock, like plywood, make sure that you get a saw that can rip at least 24 inches. If you only need to rip boards or make miter cuts for building furniture or smaller projects, then a compact saw might be just what you’re looking for. Either way, we’ve got you covered! The rack and pinion fence locks in place easily with a small handle underneath the saw and also moves very smoothly. It never goes off square so you don’t have to worry about crooked cuts! 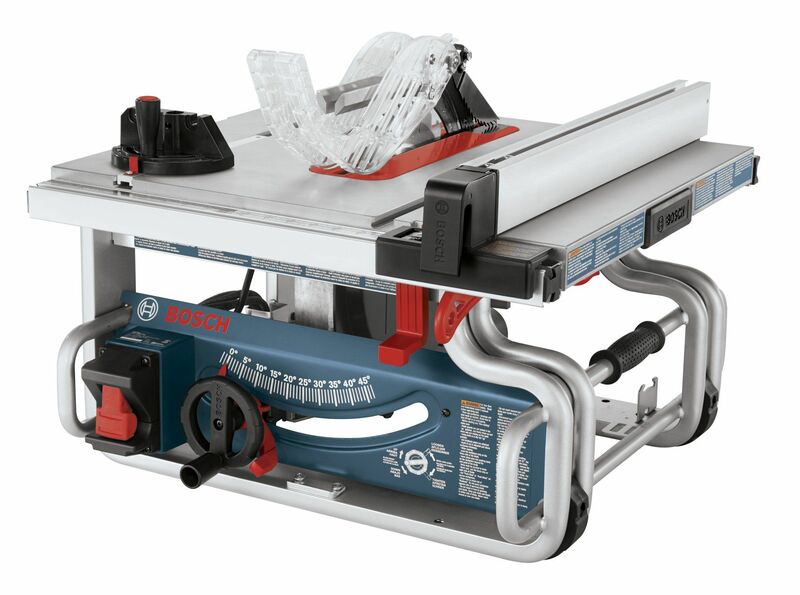 Compact size allows this home table saw to be stored easily in any space. It’s also light enough to be carried and has a convenient handle under the table. The fence holds a handy push-stick for pushing material through the saw. Push sticks are very important safety devices that keep your fingers safely away from the blade. A powerful 1850-watt motor drives this saw. You’ll be impressed at the power that DeWalt delivers in this small package. This saw can’t rip sheets of plywood in half. It cannot accept dado blades for cutting slots in wood. The miter gauge, for making angled cuts, is stored under the table and not easily accessed. This home table saw is a must buy for any DIYer! It’s very well-priced at under $330 and DeWalt has made a quality product that can cut up anything you push through it. Keep it at the top of your list, just like we did. The motor delivers a screaming 5,000 rpm from a 4-horsepower motor, which is enough to cut through anything you put in its teeth. The SquareLock rip fence system glides smoothly along the rails and locks tightly and squarely into place every time for nice, accurate cuts. It comes ready to go with a 24-tooth carbide blade, a miter gauge, a push stick and two blade-change wrenches. The Smart Guard System will keep your hands safe while still allowing you to see what you’re cutting. Two rawls and a riving knife help to prevent kickback, which is very dangerous. The rawls have backward facing teeth to stop or slow down any wood that is kicked back and the riving knife keeps the wood spread apart after passing by the blade so that it doesn’t pinch the blade and cause it to bind or kick back. Remember, safety first! It can’t cut a sheet of plywood in half. It has to be placed on something stable or there is an optional stand that can be purchased. This Bosch saw keeps it real! It’s a tough saw that makes accurate cuts. Sliding in at less than $350 this is a saw worth buying. Drive Table Saw! And, it’s portable. A worm drive provides much more torque than other types of drives. It’s the go-to drive for contractors using circular saws. The 15 Amp motor puts out a board-eating 5 horsepower! The motor is also a Dual-Field motor, which means that it will stay cooler longer. That translates into a longer motor life. It has a 25’’ rip capacity, which is unusual for such a small saw. The rip fence is self-aligning to ensure square cuts. 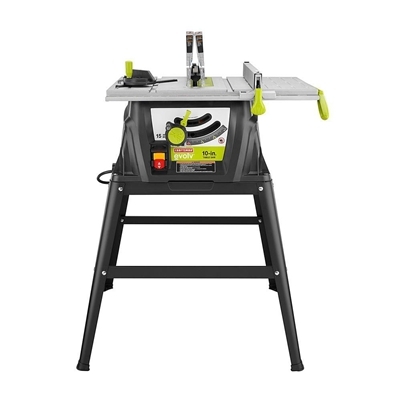 Weighs only 49 pounds so you can set it up where the job is instead of heading to the shop for every cut. The materials are not top quality. Reviews show bent pinion screws and other broken parts upon arrival. 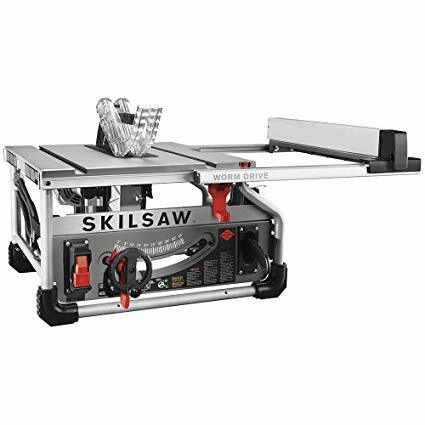 SKILSAW has really made a unique table saw here. The Dual-Field motor combined with the high torque worm drive is really quite brilliant! Less than $350 and you could own a piece of power tool history with this amazing saw! This saw has a cut depth that allows you to cut through 4” material, which most 10” table saws don’t. That’s a plus! A laser-line indicator shows you exactly where the blade is going to cut. It has a lightweight, quick fold-out stand with wheels to make it easy to push around. The rip fence extends out to 30” so you can be assured that it can cut through any sheet material. Powerful 15 Amp motor can slice up whatever is pushed through it. A dust collection bag helps to keep messes at a minimum, which is a nice feature when you’re working in a house or shop. Reviews say that the fence is not always square and is hard to get or keep square to the blade. The motor’s durability has been questioned in reviews. The miter gauge doesn’t fit tightly in the track. 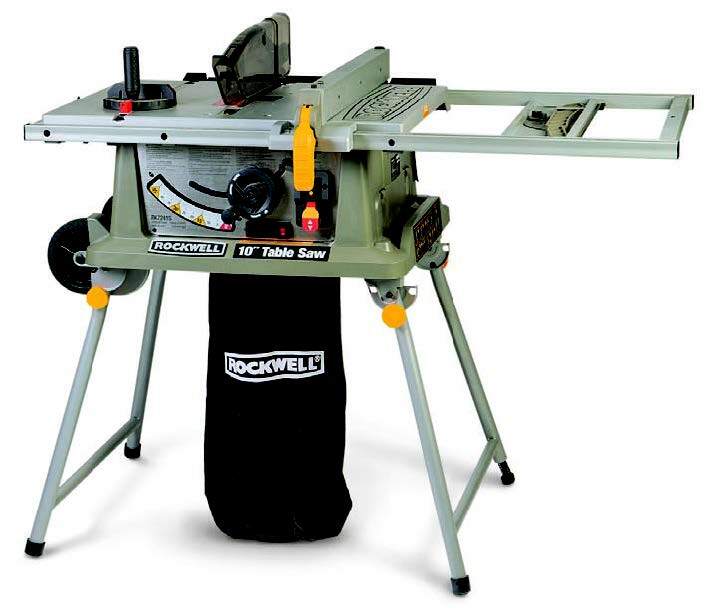 The Rockwell table saw is a great homeowner saw for light-duty work such as ripping plywood or fir boards. It won’t cut too deep into the budget at under $350 but will definitely help with that “to-do” list that never seems to end. Bring it to an end with one of these handy table saws! 15 Amp motor to cut through everything you need. 25” x 17” table surface creates a large work space for a compact saw. Easy to adjust miter gauge for quick and accurate control of your cuts. Stable, safer cutting with an adjustable anti-kickback pawl. Smooth, accurate blade height adjustment with a rack-and-pinion adjuster. Tool free internal cam lever for adjusting the river knife position. The rip fence has a quick release for fast-action. The push stick mounts on the end of the table, out of the way of your work but easy to grab when you need it. Large power switch for increased safety. Plastic body is light and thin. The Craftsman Evolv has a great price of less than $135! You really can’t beat that when you’re looking for a DIY tool to help you save money on renovation or make your niece a hobby horse. It’s a straight-forward, no frills tool that can get the job done. Make it yours without feeling like you just spent an arm and a leg. Now’s the time to get what you need and get the job done! 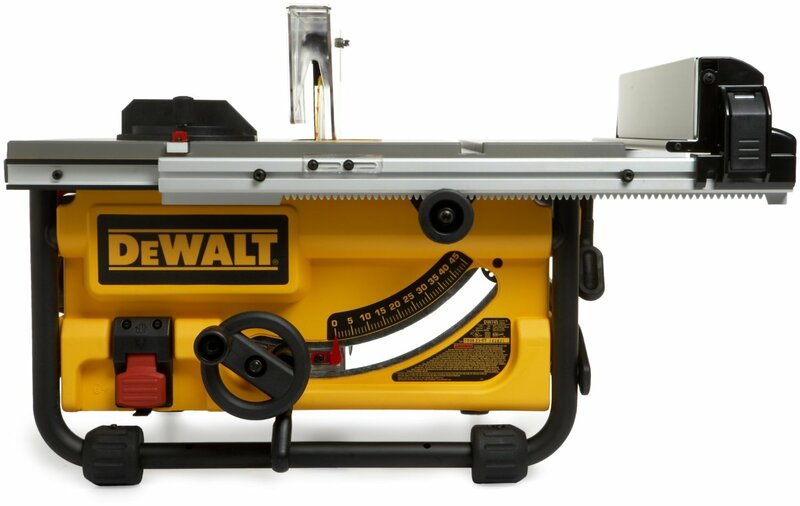 The DeWalt DW745 with 20” Rip wins the prize for the most powerful, portable and useful home table saw. Despite its size, this saw has enough power to cut through anything for years and years. All of the saws that we’ve reviewed deserve a gander, but the DeWalt is worth buying, without hesitation. It’s a favorite of contractors and DIYers alike for many reasons.